The 122nd Boston Marathon will take place this year on Monday April 16. Participants and spectators of the marathon can attest to the wide range of weather conditions that can occur during this time of the year as winter transitions into spring, so here’s a look at some climatology based on previous Marathon Mondays. Most of the Boston Marathons have occurred with high temperatures reaching 55 degrees F or above, and 5% of races have happened when the high temperature was over 80 degrees F.
More than half of the Boston Marathons have fallen on days where temperatures were at or above 55 degrees F. There have been a handful of years (8% of races) where the high temperatures were 45 degrees F or lower, which created unusually cold race conditions. 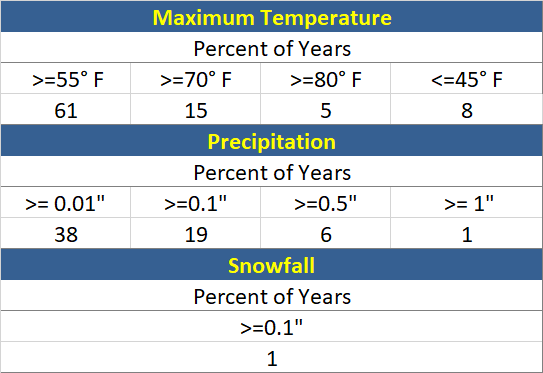 The normal temperature for the middle of April is between 55 and 58 degrees F.
In the past, snow has been much less of an issue than rain, which is typical for this time of year. 1961 happened to be the most recent time that it snowed on the day of the marathon. 19% of race days have had over 0.1 inches of rain, with only 1% of races receiving over an inch of rain. The highest temperature on the day of the race was 87 degrees F in 2012, whereas the coldest temperature on race day was 38 degrees F for two years in a row starting in 1925. Race day over the past ten years has had temperatures ranging from the upper 40s to an unusually warm 87 degrees F. The average temperature from the previous 122 marathons is 58.6 degrees F. For those who are curious about this year’s weather forecast for the marathon, check out the National Weather Service for the latest weather information. Best of luck to all of the Boston Marathon participants!